Brent says it is like some sick video game for me, I just can't stop playing. I'm addicted to redesigning a home. Specifically my neighbors home, 4 doors in on the cul de sac. It sounds psychotic. It is. A little. We are in the process of purchasing it actually, so it isn't that weird. Things are still unofficial...there are some kinks to work through but it looks like it will happen in the next several months. So...out comes my obsessive side. 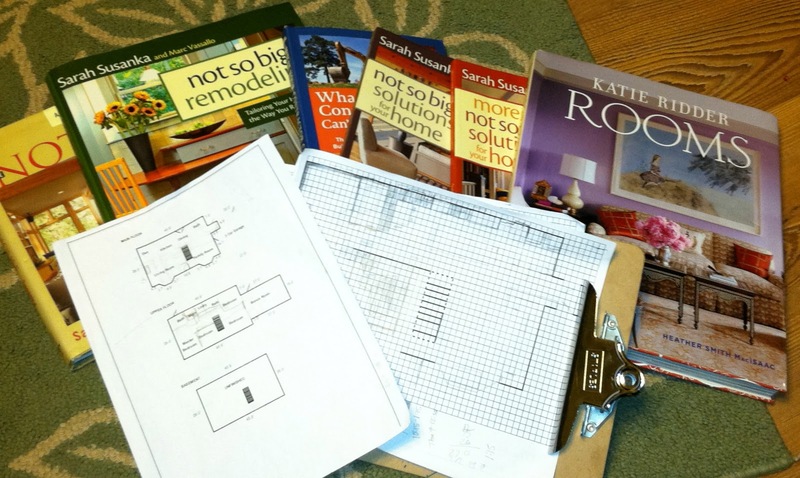 I've always loved architect and author Sarah Susanka of The Not So Big House series. In fact, I think I own all of her books. Now, I love the website Houzz.com. You can look at my ideabooks there, I think my name is savvymay. My favorite app that keeps me warm at night: Home Design 3D for my ipad. At 12:30 am you can often find me wandering through my virtual world in my 3D house. I should have included a tape measure in this photo, because really, I carry one every where with me now. I think I have measured my kitchen cabinets 10 times at least. Most difficult will be leaving our small but gorgeous and endearing yard. We are trading for a bigger house and 1/3 acre lot, which stares directly at another house (and the gorgeous Mt. Timpanogos right above). I have quite a bit of vision for the house and yard. With some TLC and of course the mighty greenbacks, I think we can create something beautiful and very functional for our family.